I’m so happy you’re here! I get the search for a photographer. Its tough. There are so many out there, and the investment cost can be intimidating. But I can assure you that when you choose me as your photographer, you’ll be hiring someone who cares about you, and works really dang hard to get you an amazing result. I’ve been doing this for 3 years full time now, and I LOVE it. If you’re an Enneagram buff, you’ll know what I mean when I say that I’m a 9. I really care that my work is contributing to something meaningful, whether that means working for organizations who share my values, making my clients feel at peace, or creating impactful art for the world. I’ve got a handsome hubby, and I am a first time mom to the CUTEST baby girl. We love spending time together and are figuring out this parenting thing day by day. I’m a fan of the outdoors, spirituality, and a good IPA. I found Crystal through Instagram after searching through hundreds of photographers in the Atlanta area. What I was looking for wasn't your typical photoshoot. 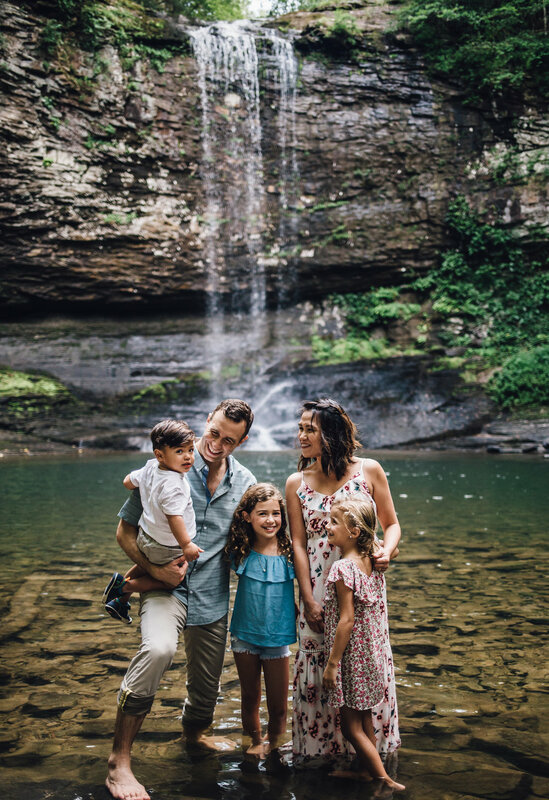 I wanted to find a photographer adventurous enough to come document my family of 5 hiking through Cloudland Canyon. Crystal's style is both light and moody at the same time. I don't know how that's possible, but through her lens it is. Besides the obvious talent she has, what makes her a gem is her sunny disposition and easy-going nature. Crystal was amazing with the kids and she put everyone at ease! Our pictures came out like they were from a magazine. I actually contacted Crystal again to photograph our AirBnb. We needed some fresh pictures that would draw bookings...voila! Once again, Crystal delivered. We've had so many compliments on our pictures and not to mention, so many bookings. After all, pictures tell the story 10x better than words could. I highly highly recommend Crystal for her talent, her professionalism and her dedication to her craft. Crystal is the best! We did both our engagement and wedding photos with her and they turned out so beautiful! She made us feel comfortable during both sessions. She also has great command of her subjects. The family photos went so smoothly, it was awesome. We’re so thankful for Crystal. We couldn’t have asked for a better photographer! Crystal is our favorite photographer! We have used her for maternity, newborn (hospital and home), and Christmas family photos and every session has been outstanding. She is so patient, kind, and helpful with our family. Even though the sessions were within months or weeks of each other, no two pictures are alike - she has such creativity that absolutely shines every time we meet her! We will be using her for all our family photos for years to come! Crystal, you are so easy to work with. Your passion to not only take amazing photos, but to truly capture people's relationships and emotions is so evident in your work! Clay and I are so happy we chose you for our big day! Crystal made our session with our 6 month old so relaxed and comfortable. I cherish these photos, and we have so many printed and hanging on our walls. It makes me grateful we had her to capture this moment in time that now seems like a blink. Or around what time are you thinking to have the shoot? Tell me any other info that you'd like me to know! Do you have a budget? If so, what is your range?